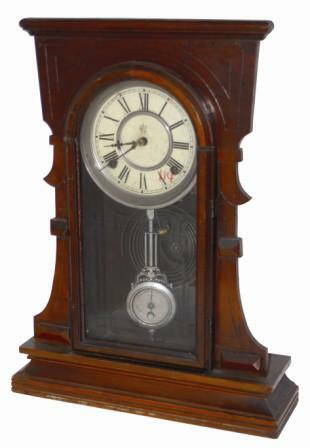 Waterbury Clock Co. walnut parlor clock, "Murray", ca 1891. This is a very plain, but very nice walnut case. You can use it like it is pictured, even though it is missing a top. A very fancy top I may add. I thought I had something until I saw the picture showing what it should look like. Very nice original glass, signed nickel pendulum bob, nickel dial rings, signed original dial, and old hands. The 8 day movement and gong are also original. White on the bottom are scrape marks from hauling, no harm, will clean off. I just looked on the back and the label (maybe 25 percent there) says this is a "Medina", ca 1890. Those company's were sneaky, same clock, just changed the top a little. The Medina top is simple compared to the Murray. Anyway, here it is. Ly-Waterbury No. 1711 and No. 1592.